One of my favorite ways to spend a day off is at one of the sand and gravel pits which a local farmer very kindly opens to the public as a shooting range. I like to go with one or two guns, and few hundred rounds of ammo, and punch tin cans, plastic bottles, or other suitable targets. For the best and safest time, you need the proper gear. New shooters may not be certain as to what they will need for a few hours at a range, or a sandpit for plinking, and may have to learn by trial and error- wishing they had brought certain items with them, and finding some things they brought are never used. Here are some suggestions as to what to pack in your range bag. 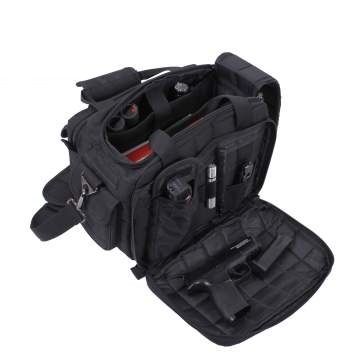 The range bag can be actually made for the purpose of carrying ammo and shooting gear, or you can use a soft tool bag, or a duffel bag with compartments. I personally don’t use an actual bag but rather a 24” Stanley tool box. A big fishing tackle box can also be used. Lots and lots of ammo for every gun you bring- for obvious reasons. Targets. To to save money for more ammo, why spend a lot on something you intend to shred with bullets, especially if you are plinking, rather than sighting in a gun. I will get some papers plates, and slap a post it note in the center. Or blow up some balloons, and staple them to a backing. For three dollars from the dollar store, you can get a large supply of targets. A soft gun rest ( you can make one- fill a sock with rice, sand, or Styrofoam packing material). Staple gun– I use a heavy duty staple gun to mount targets on a backing. Staples– because staple guns can run out of ammo too. Dark shooting glasses– dark lenses/mirrored glasses, OSHA rated for impact resistance, and rated for UV protection to cut glare on a bright day and protect your eyes. Yellow or clear shooting glasses– for overcast days. Binoculars- a small pair to check where you hit your target without going forward of the firing line. Hearing protection. Both ear muff type and ear plugs are useful. Use both if you are shooting something really loud. Some days it may be too hot to comfortably wear ear muff type protection, and ear plugs will be more comfortable. I keep mine on the front seat as I am driving down into the sand pits, as there may be other shooters already banging away. Hearing protection is very important, as even one time exposure to noises over 100 dB is uncomfortable , and 120 dB can can permanently damage your hearing after one time exposure. Gunfire rates above 140 dB which is well above the range in which hearing damage can occur. Hat with a brim – to protect your head from the sun, and hot brass if a casing flies in the wrong direction. Water– always bring twice as much as you think you will need- if you are going to be shooting on a hot day for a few hours, stay hydrated, as even mild dehydration can impair cognitive performance e.g., concentration and attention- diminishing your accuracy. Sunblock– I have to have this, at least 50 power, and I cover myself with it, as I am bald/head shaved, and burn like a lobster. 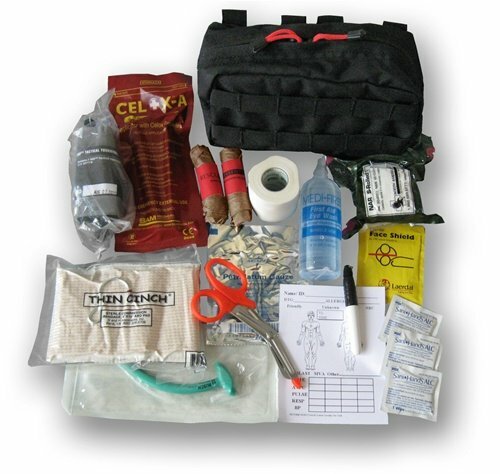 A good quality first aid kit including Quik- clot sponges and a cell phone– just in case- It is a precaution that could save someone’s life, which you hope you will never ever need to use. You should at least take a Red Cross 1st Aid course, or better yet, Red Cross Basic Life Support for the Professional Rescuer. WD-40 and Cleaning rags – wipe your guns down when you are finished before acid from fingerprints can start doing damage. Tools– screwdrivers, and an Allen wrench set for adjustments to sights, or changing out barrels if applicable. Duct tape for mounting targets, for an emergency bandage, and countless other uses. Digital camera to record the fun- and for a visual record for later scrutiny and correction of your shooting technique. A supply of empty cans for plinking. Wooden stakes and a hammer for mounting targets- pound them into the ground and staple or duct tape targets into place. A small hand rake for easy clean up of brass. A blanket to lay on the ground if you are shooting prone. Alcohol- ( see Firearms and Alcohol Don’t Mix). Poor Manners (see Gun Owners and Gun Violence ). Be well prepared, but not weighed down with unneeded items, for the most fun and safety when you go shooting.